Early in 2018, EON Benevolent Fund employed JJ Shadforth and Woyo Frank to demolish the existing EON Garden which had become derelict and unsightly. JJ project managed the demolition with help from the KRCI crew. With financial assistance from EON and guidance and support from the amazing Jenny Hurse, garden beds, seedling tables and compost bins were salvaged and moved closer to service our Hospitality Kitchen. We have planted tomatoes, chillies, capsicum, sweet potatoes, corn, lettuce, broccoli and cauliflower along with many herbs. Lemon, lime, orange and dwarf fig trees will provide us with fresh fruit for years to come. 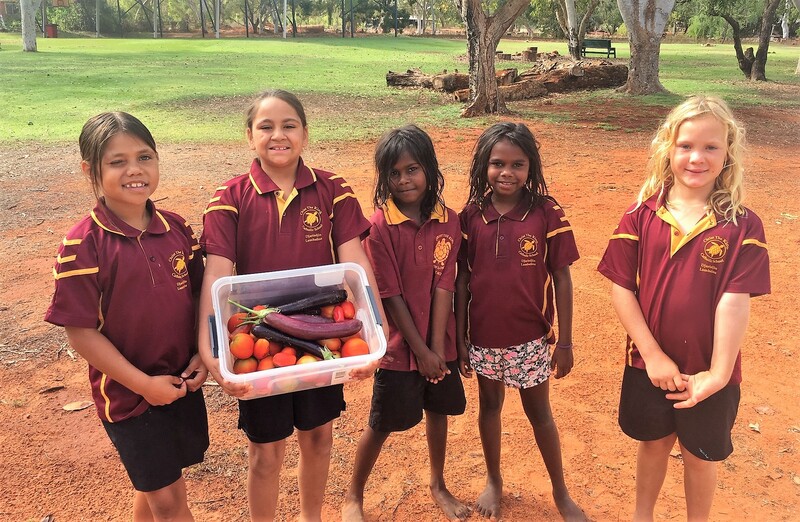 Each class is responsible for tending the garden and valuable lessons are conducted on preparing soil, making compost, raising seedlings, planting and propagation as well as harvesting. With help from Jenny Hurse and our own cook, Jaylynn Lane, students will be able to use the produce to prepare delicious and nutritious lunches. Thank you EON for funding this project to support our school’s education and nutrition programs, at the same time providing employment in our community. Thank you also to our groundsmen Macca and Mark for their hard work in the demolition of the old garden and construction of our new garden which the children have chosen to call “The Bishop’s Garden”. JJ and Woyo ready for action. The KRCI boys lend a hand. Students got to work planting. Mr Mark supervised the work. Finally we added a pig proof fence! Our garden looks beautiful now. Our first crop of vegetables.